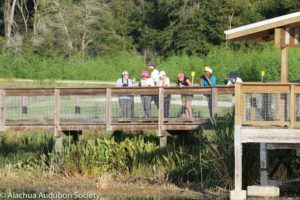 Santa Fe College’s (SFC) Community Education Program in collaboration with The Alachua Audubon Society (AAS) offers a 4-week course in Field Identification of Birds. Offered for Fall and Spring semesters, registration is through SFC and costs $49. For more information and registration, go online to SFC Community Education (click TAKE A CLASS and search for “bird watching”) or call (352) 395-5193. These courses continue to receive great reviews. Limit 12 students (of all ages), so register early as they fill quickly. 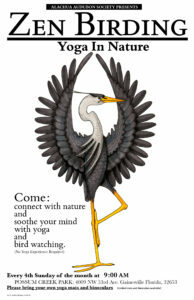 Hope to see you in class! Hi, I want to take the class, but will have to miss the first session because I am a site leader for the Invader Raider Rally. What gets covered in the first session? I was praying that enough interested persons would sign up for this class starting March 30th. Unfortunately, it didn’t happen. Hopefully, friends and other interested bird watchers, will be able to encourage others (including high school students).